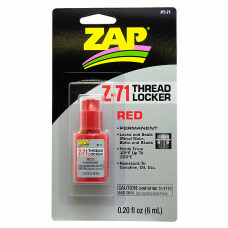 Finest red thread locker you can buy! Lock set screws, axle and drive nuts, engine mounting screws, or any screw that keeps your R/C airplane, helicopter, car, or boat from coming apart. 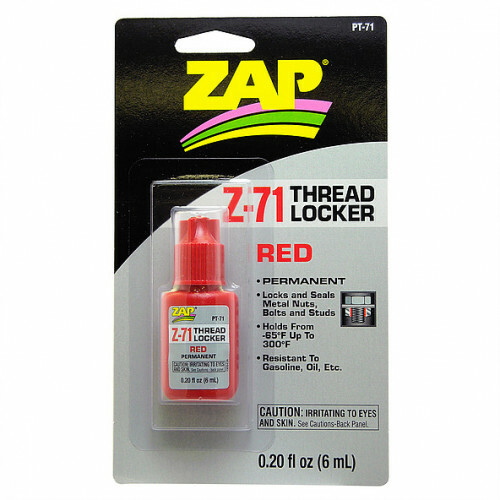 But Z-71 Thread-Locker isn't just for hobbies, use on autos, boats, snow mobiles, lawn equipment, tools, bicycles, and even toys. Anywhere fasteners are subjected to vibration that can cause them to loosen and fall out Z-71 Thread-Locker helps to keep things together. Do not send mail to the Jordan Road address; it will be returned by the Post Office. Copyright © House of Balsa, 2019.